With the penetration and disruption of the internet because of JIO, e-commerce has gained very much popularity with many people selling online. Therefore, today, I am going to explain you e-commerce accounting entries in Tally with GST. 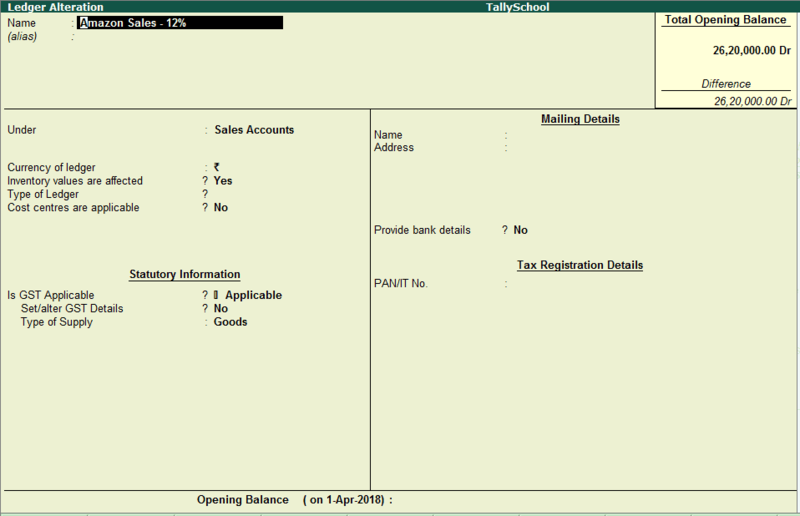 Tally ERP 9 can be easily used for online sellers because accounting entry for online sales is almost similar in comparison to selling offline i.e. in brick and mortar stores or shops. I had created an e-commerce website in the past and have sold the products on two other online platforms which are Amazon and Flipkart. But, the process of e-commerce accounting entries in Tally is 99% similar, no matter on what online platform you are selling. Firstly, Accounting Entry in Tally for selling your own goods online. For example, if you sell a mobile phone on Amazon, then what would be the accounting entry for that in Tally? Second challenge is the accounting entry for charges that are levied by the e-commerce operator. For example, Flipkart charges you commission, fixed and variable fees and sometimes shipping charges also. So what would be the accounting entry for this in Tally? On the above 2 transactions, GST is also levied and that scares people because so many things are involved in just one or two transactions. But, once you understand the process, it is very easy for you to create entries and file the GST returns as well. In this post on e-commerce accounting entries in Tally, I am going to explain you both the above challenges with GST. Collectively, I call it e commerce accounting entries in Tally with GST. Let’s start with 1st challenge of the two challenges in our e-commerce accounting entries in Tally with GST. Online Sale Entry in Tally – Amazon, Flipkart, Myntra etc. 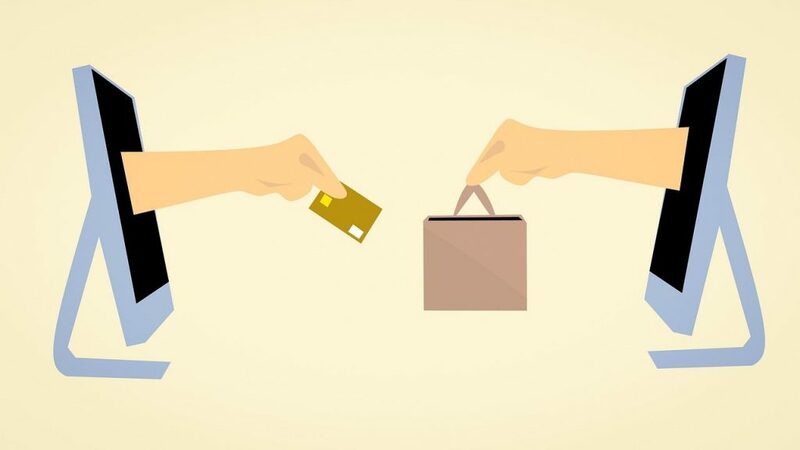 Let’s take an example when you sell something online on Amazon, Flipkart or any other online platform. This entry is used when you sell anything online through any platform other than your own platform. When you sell something online on Amazon, Flipkart and so on, they are called E-Commerce operators as per the GST law. I am selling Samsung Galaxy S9 for ₹70,000 and the GST rate is 12% and Samsung Galaxy J8 for ₹19,000 with the same GST rate. Along with the above, the shipping charges are ₹100. The sale is inter-state sale because this is what generally happens in e-commerce sales. The name of the customer is Rohit and his address is Yaara Di Gali, Karol Bagh, Delhi – 110011. We are selling these mobile phones on Amazon so this is also called amazon entry in Tally by many people. Now, for creating the above e-commerce accounting entry in Tally, we need to create the following ledgers. GST taxation ledgers Tally i.e. CGST, SGST and IGST. Stock Item Ledgers with GST rate configuration. Sales Ledger for accounting different kind of sales along with GST configuration. Sundry Debtors Ledger as E-Commerce Operator. 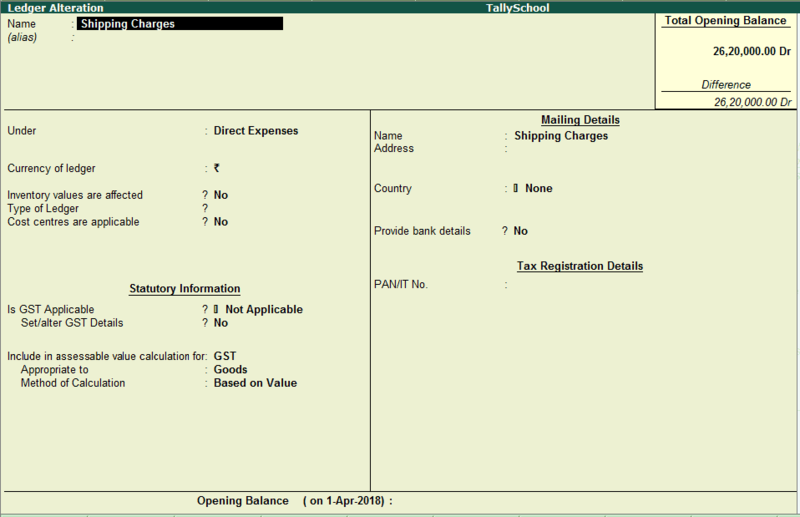 Direct Expenses Ledger with GST Configuration for Shipping Charges. I have created a post in which I have explained how you can create different GST taxation ledgers along with a GST invoice. You can go through it. Here I’ll explain a little bit different and easy method. You can follow both of them as you like. For creating GST taxation ledgers in Tally, you need to follow the simple steps below. Under Single Ledger, select Create. Now, in the Name field, enter the name IGST. Press Enter and come down to the option of Under. In there, select Duties & Taxes from list of ledger groups in Tally from the right hand side of the screen. In type of duty/tax, select GST and in Tax Type, select Integrated Tax. 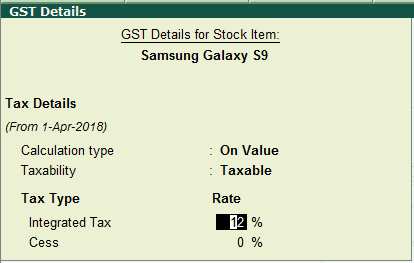 Set the Percentage of Calculation to 0% because Tally will automatically take the percentage of GST from Stock Items and Sales Ledgers. Select Normal Rounding as the Rounding Method and Rounding Limit to 0. Keep pressing Enter until you save the ledger. In the similar way, you can create ledgers for SGST and CGST. Now that the GST Taxation Ledgers are created, we will create Stock Items with GST Configuration in Tally. I have created another post in which I have explained Stock Items in Tally in detail. Please go through it for a deep understanding of creating and using stock items in Tally. In this post, we will create 2 stock items which are Samsung Galaxy S9 and Samsung Galaxy J8 as per our example. Then, go to Stock Items. Under Single Stock Item, select Create. Now, in the Name field, write Samsung Galaxy S9. In the option of Under, select Primary. In Units, you need to create a unit if you have not created yet. I have created it and it is NOS – which is short for Numbers. Next, in the option GST Applicable, select Applicable. Write Y and press Enter in Set/Alter GST Details option. This will open a new small window in the upper left corner of the screen. In Tax Details, select On Value in the option Calculation Type. Leave the Cess to 0%. Now, you will be back in the pink Stock Item Creation Screen. In Type of Supply, select Goods as we are selling goods. Now, come to the Opening Balance which is at the bottom of the pink screen and enter the quantity as 2 and rate as ₹60,000. Press Enter and save the Stock Item. We have successfully created stock item with GST configuration as well. In the similar way, you can create a Stock Item ledger for Samsung Galaxy J8. I have created the Stock Item for Samsung Galaxy J8 for ₹15,000 each with opening balance of 2 mobile phones. Now, let’s directly jump on to create a Sales Ledger with GST Configuration. Creating an e-commerce sales ledger is similar to creating any other sales ledger in Tally. Let’s see how it is done. 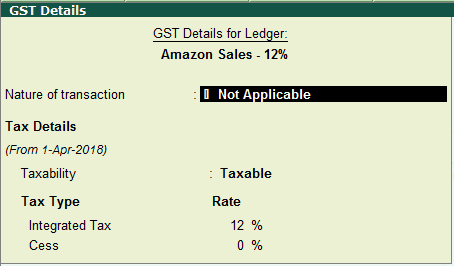 In the Name field, write Amazon Sales – 12% as we are selling on Amazon and product attracts 12% GST. Select Sales Accounts for the option Under from the list of ledger groups. Set the option Inventory Values are Affected to YES. Select Not Applicable in the Type of Ledger. Now, in the option – Is GST Applicable, select Applicable. 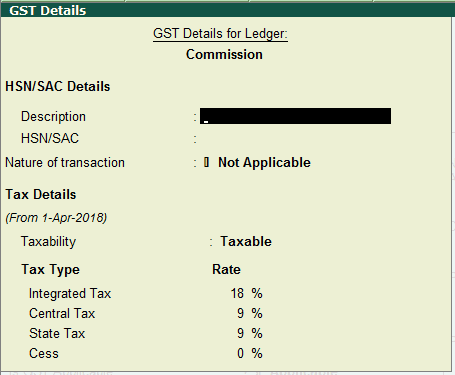 Write Y in the option Set/Alter GST Details and press Enter. 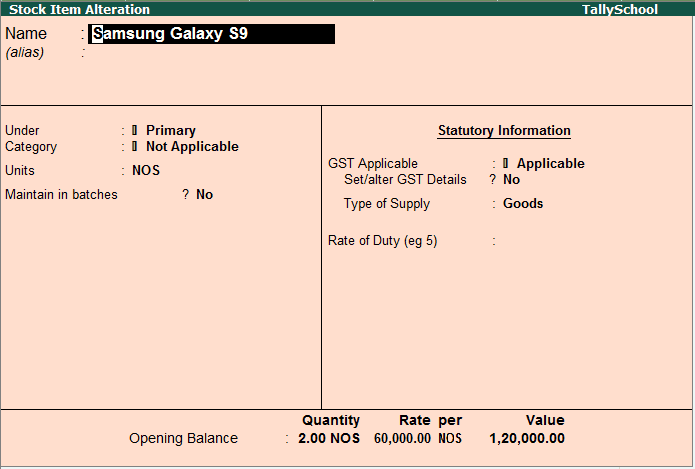 You will see a GST details screen. In the Nature of Transaction – select Not Applicable. Select Taxable for the option Taxability. In the Integrated Tax, type 12% and for Cess, it is 0%. Now, you will be back to the Ledger Creation screen. Select Goods as Type of Supply. Press Enter until you save the Voucher. Until now, we have created GST Taxation Ledgers, Stock Items with GST and an E-Commerce Sales Ledger for creating our E-Commerce accounting entries in Tally. Now, we will create a Sundry Debtor ledger in Tally which is important as we are selling online. This is a tricky one because we are selling online to someone else but we are getting the payment from Amazon, Flipkart etc. which are E-Commerce Operators. How can this be done in Tally? There is a creative method for this. This method is divided in 2 parts. I’ll explain the first part here and the second part at the time creating the entry. For creating Sundry Debtors Ledger for E-Commerce Accounting Entries in Tally with GST, you need to follow some simple steps ahead. From Gateway of Tally, press A, then L and then C. This is a shortcut way to move in out in Tally. In the Ledger Creation Screen – in the name field, type – Amazon as we are selling on Amazon. In the option of Under, select Sundry Debtors from the list of groups. Select YES, against the option of Maintaining Balances Bill-by-Bill. Set the Default Credit Period to 15 days or according to the time your e-commerce operator pays you. Select YES for the option to Check for Credit Days during Voucher Entry. Don’t specify any Credit Limit in the next option. Enter the Mailing Details which will include Name, Address, Country, State and Pincode of Amazon. In the Registration Type, select Regular. In the next option, enter the Amazon GSTIN. Final and the last option is Set/Alter GST Details. Type Y and press Enter. Type Y against the option – Is an E-Commerce Operator because Amazon is an E-Commerce Operator. Leave all the other options as it is and save by pressing Enter. Now, you will be back to the Ledger Creation Screen and press Enter a few times until you save the ledger. In the similar way, you can create Sundry Debtors Ledgers for other E-Commerce operators such as Flipkart, Myntra and so on. Now, we will create a Direct Expenses ledger for Shipping Charges. When you are doing e-commerce accounting entries in Tally, one of the most used ledger is Shipping Charges. It is very normal for anyone selling online to take shipping charges along with the product sold. Along with Shipping Charges, also comes the GST. So, it becomes a little confusing for people but I’ll make it crystal clear for you. For creating the Shipping Charges ledger, follow the simple steps below. From Gateway of Tally, press ALC consecutively. In the Name field, type Shipping Charges. For the option Under, select Indirect Incomes from the list of groups. Set the option Inventory Values are Affected to NO. Select the option – Type of Ledger to Not Applicable. Select Not Applicable in the option – Is GST Applicable? A new option will appear – Include in Assessable Value Calculation for. Select GST in that. In the option – Appropriate to, select Goods. In Method of Calculation, select Based on Value. Press Enter until you save the ledger. Now, that we have created all the required ledgers in Tally, we can finally create our e-commerce accounting entries in Tally with GST. 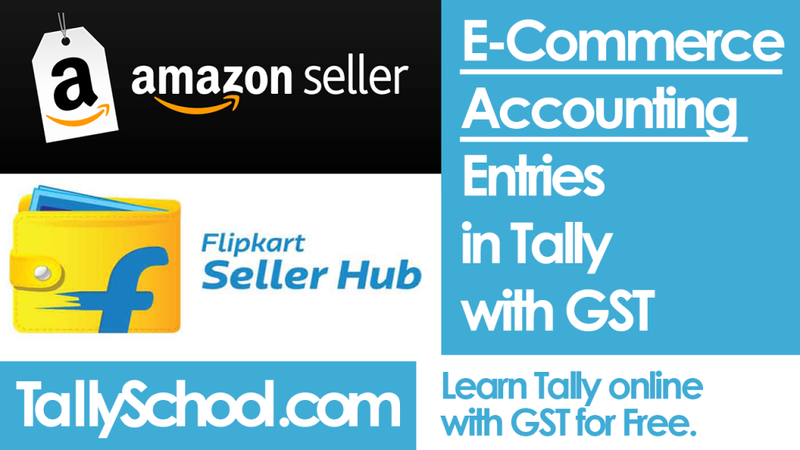 E-Commerce Accounting Entries in Tally with GST – Amazon, Flipkart, Myntra etc. We will do a simple e-commerce entry in Tally with GST and along with shipping charges. I am selling Samsung Galaxy S9 for ₹70,000 and the GST rate is 12% and Samsung Galaxy J8 for ₹19,000 with the same GST rate. Along with the above, the shipping charges are ₹100. 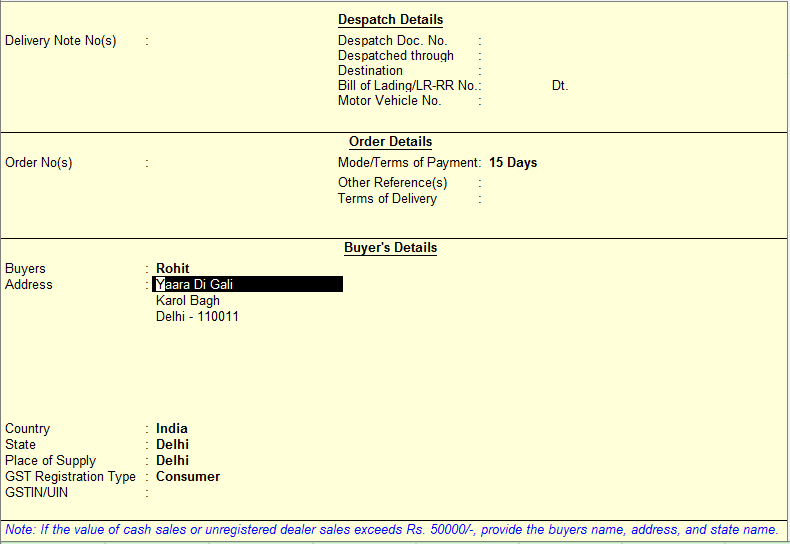 The name of the customer is Rohit and his address is Yaara Di Gali, Karol Bagh, Delhi – 110011. Let’s start with the e-commerce accounting entry in Tally or Amazon Entry in Tally since we are selling on Amazon in this example. Select Sales or press F8. Select appropriate date and come to the option Party A/c name by pressing Enter. Select Amazon in this option from the list of ledger accounts on the right hand side of the screen. Now, as soon as you press Enter, you will see a yellow screen for filling in the Desptach Details, Order Details and Buyer’s Details. Come down to Buyer’s Details because this is the most important step while you are doing e-commerce accounting entries in Tally with GST. In the Buyer’s Details, you have to enter the details of the customer who actually ordered the product online. You can easily see that in your Amazon Sellers dashboard or Flipkart Sellers dashboard. In our case, we will enter Rohit in Buyer’s Name and the address in the Address Field. Now, press Enter and select Country as India and State and Place of Supply as Delhi. In the GST Registration Type, you have to select Consumer because it a consumer who is buying from you. Now, you have to select the Sales Ledger which we have already created. It is Amazon Sales – 12%. Press Enter and go ahead. This is the time to select the products. Select Samsung Galaxy S9 with price of ₹70,000 and Samsung Galaxy J8 with price of ₹19,000. As soon as you come down below the total amount which is ₹89,000, you have to include the shipping charges and GST taxation ledgers as well. First we will select Shipping Charges ledger because that way, GST will also be calculated on shipping charges. So, select Shipping Charges and in the Amount column, enter ₹100. As we are selling interstate, we have to IGST. Select that, and GST will automatically get calculated in Tally. Press Enter and you will come down to the option of providing GST e-Way Bill details in Tally about which I have written a whole post with a video. 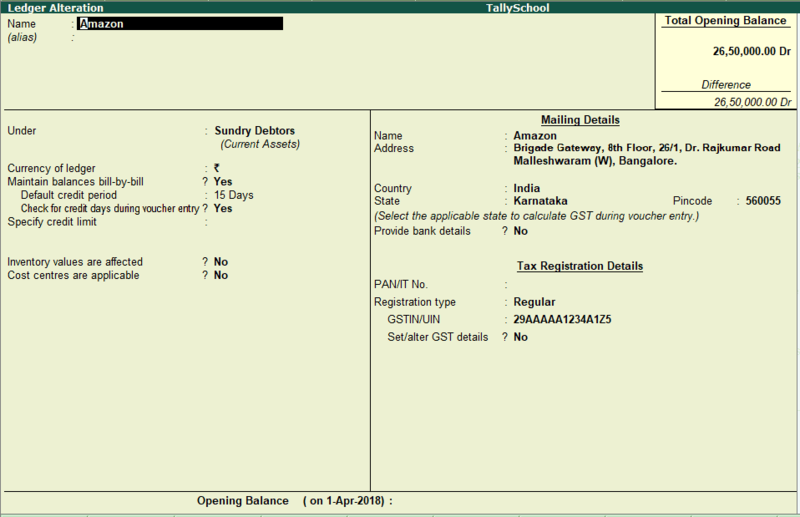 You can go through that to easily learn how to enter the e-Way Bill Details in Tally. Currently, I am setting it to NO, because I don’t have all the details of transportation as it is just an example and the post will be too long. Now, press Enter until you save the voucher. 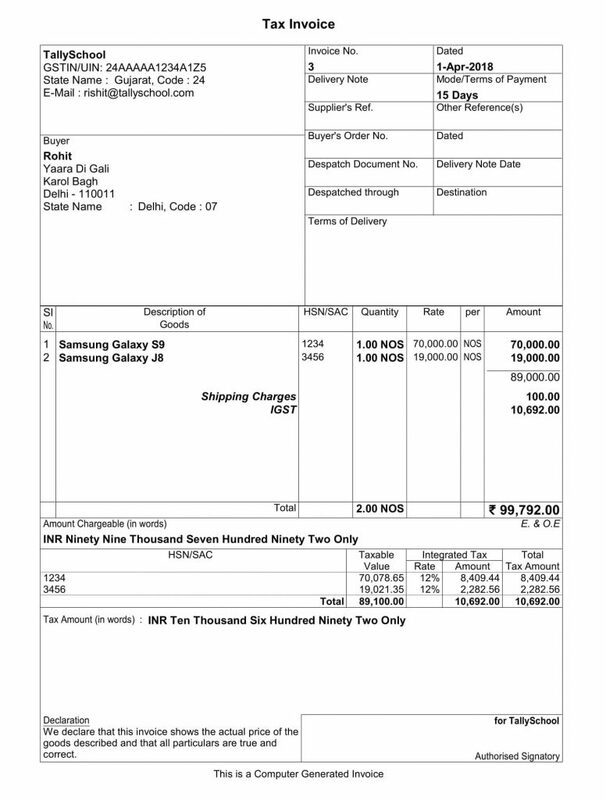 Total amount that came in voucher is ₹89,000 + (Shipping Charges – ₹100) + (IGST – ₹10,962) = ₹99,792. You can now print the voucher by pressing Page Up and then ALT+P. Have a look at the invoice below which contains all the necessary details of the amazon entry in Tally. Now, we will look at the commission, fixed fees and variable fees that are charged by the e-commerce operator along with GST and the remaining amount is transferred to your account. The remaining amount is called Settlement Amount. Our total selling amount in the above example was ₹89,100 excluding GST which you collect from the customer. Let us assume that Commission on the above sales is 5% of total sales value which will be ₹89,100 x 5% = ₹4,455. And also assume that Variable Fee is ₹500 and Fixed Fee is ₹150. Therefore, final settlement amount will be ₹89,100 – (₹4,455 + ₹500 + ₹150) = ₹83,995. And, GST on all of the above charges is 18%. We will also include that in the entry. So now, we have to create ledgers for the above expenses that we are going to incur. First of all, we will create a ledger for Commission. In the Name field, type Commission. Against the option Under, you have to select Direct Expenses. Come down to the Statutory Information options and select Applicable in the option which says – Is GST Applicable? Type Y in Set/Alter GST Details and press Enter. 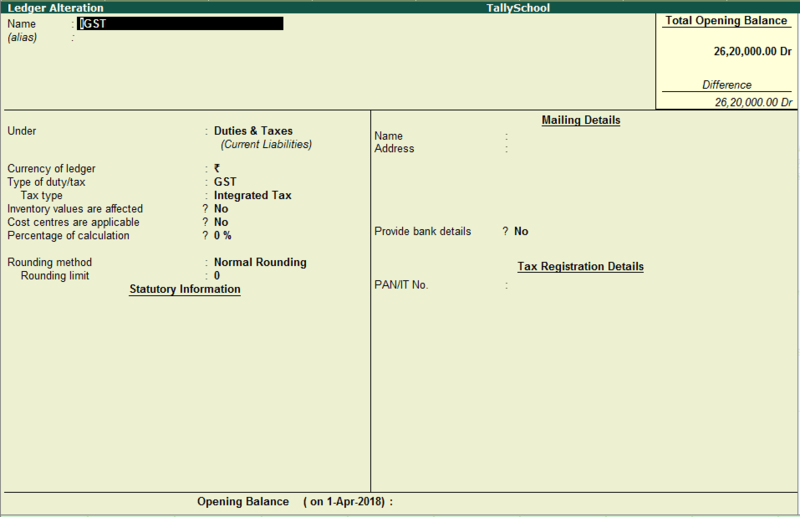 A small GST Details screen will open up in which you have to fill up Tax Details. In Nature of Transaction, select Not Applicable. The rate of tax will be 18% Integrated Tax. Now, you will back in the Ledger Creation Screen. Select Services in the option of Type of Supply. In this exact similar way, you have to create ledgers for Variable Fee and Fixed Fee. Now, let us do the entry with the example and the amounts that we have taken just above. Here is how you do one of the final e-commerce accounting entries in Tally with GST. 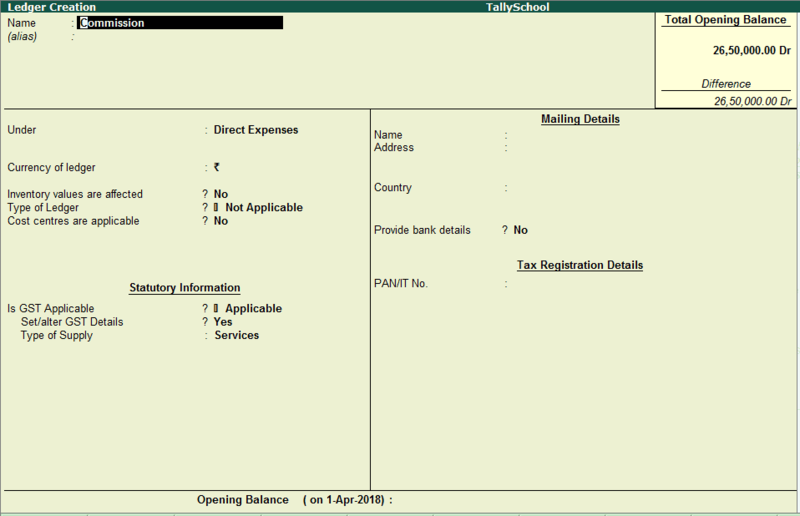 From Gateway of Tally, go to Accounting Vouchers or simply press V.
Press F6 or click on Receipt on right hand side of screen. In the Credit or CR or To row, you have to enter Amazon because it is our debtor. In the amount column, enter the total amount which is ₹99,792. Now, in the Debit or DR or By row, we have to enter all the different amounts. First enter Commission which is ₹4,455. Then, enter Variable Fee – ₹500 and Fixed Fee – ₹150. Now, we have to enter the IGST on the above commission and fees. It will be ₹4,455 + 500 + ₹150 = ₹5,105 and 18% of it is ₹919. And, finally we have to enter the Bank Ledger because you will receive the final settlement amount from Amazon in your bank account. The settlement amount will be calculated by Tally itself which comes to ₹93,768. In the above e-commerce accounting accounting entry in Tally with GST, we have covered the commission and fees as well as the final settlement amount. We did two things one single entry. That’s the beauty and simplicity of Tally. Now, you have to check 3 things to verify all the e-commerce accounting entries in Tally with GST that we have done. We need to check Profit & Loss Account, Balance Sheet and GSTR-1. I have explained all three of them along with the entire process of creating e-commerce accounting in Tally with GST in the video below. This was a much needed entry for the people who are trading via e-commerce in India and that number is growing at an exponential rate. E-Commerce accounting entries in Tally with GST are very simple if you set the ledgers correctly and do the right kind of entry in Tally. I have given a very relevant example and explained the whole process of e-commerce within just 2 entries in Tally. That is how it should be done. Less work and more impact. If you have any questions regarding e-commerce accounting entries in Tally with GST, you can comment down below and I will be happy to help you out. Note: I have team including CAs who can handle all your e-commerce accounting, GST and Income Tax needs. You focus on selling online and we will handle your accounting and taxation. Please email me your requirements and I’ll get back to you. It would be really great if you cab please explain the entries for a person who has his own e-commerce store. Q1: How can I make sales invoice for this and payment receipt entry. Q2: Also it is important to note that, the payment gateway generates a consolidated invoice at the end of every month which carries the consolidated transaction charges for whole month and GST amount. and they upload this consolidated bill to GST portal against our GST number. So how can I make entry of this Payment gateway consolidated invoice and how can I make Payment entry for this. Note that, actually for this consolidated payment gateway invoice, I do not ned to make any payment to payment gateway because the amount is already deducted by payment gateway when they release the payment for transactions to us. In Tally, you can create GST Inclusive entries. For that, you have to enable option by pressing F12 while in the Sales or Purchase Voucher. With that being said, here is how you can create your entries in Tally or any other accounting voucher if you are selling goods through your own ecommerce store. I’ll be taking your dummy transaction as the example. When you sell item A for ₹419, you will have to do the following entry. When you receive the consolidated amount from your payment gateway after deduction of charges in your bank account, here is how the entry will be done. By these two entries, you can handle your entire ecommerce business accounting. If you want, I have a team including CAs here in Gujarat that can handle your ecommerce accounting at affordable rates. You can email me and we can talk on phone too. In this example, I have taken GST of 12% from the e-commerce supplier on ₹1,000 which is the commission. I know that e-commerce sites raises bills monthly. For that you have to do the same entry as I have shown but you have to take all the invoices instead of just one invoice that I have taken against which monthly commission bill is raised by the e-commerce company. For example, if you have 40 sales during the whole month, you have to take 40 sales in that entry by just selecting the invoice numbers. Is there is any better way / tool of handling large numbers of orders and respective data in tally.? Also how about TDS and what will be accounting entry ? There is an option for entering Purchase and Sales orders in Tally. You have to create an e-way bill for e-commerce sales you will be supplying the goods and not the e-commerce operator.